This one sounds super suspenseful! I wish Rick was coming to Colorado (Rick, if you're reading this, you need to get out West!). I agree with Jess (except come to the North East too). Massachusetts is lovely this time of year (and every time of year, except for winter, before winter, and after winter). This looks super cool. I love dystopian books, and Rick Yancey is awesome. You're right, that book does sound good! Dystopian sounds like such a hard genre to write, but the books I've read lately in that genre have been done really well. Thanks for the giveaway! I love dystopias. Oh, gosh, I've heard so many good things about this book! Thanks for the giveaway! It sounds super intriguing. I am wondering what is the wave. Its driving me nuts!! Sounds very interesting, and since I really enjoyed Enders Game (The only book by Card I can even read) I'm excited to check it out. I sooooooo want this book!!! Thanks for the chance at it. Eek! 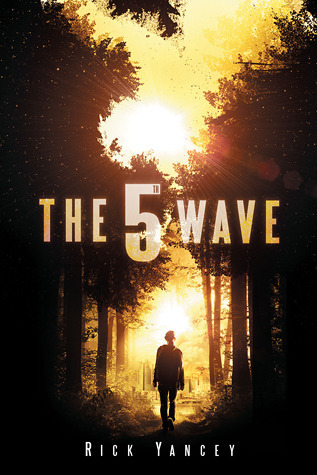 I think The 5th Wave sounds amazing. I've been looking forward to reading it for awhile now! thanks so much for the opportunity! Let's hope it meets our expectations (I'm not that worried about it not meeting them). Sounds really cool--kind of "The Road" for YA. Am going to put it on my Goodreads list right now! Rich Yancey's Alfred Kropp series is one of my favorites. My 16 year old just read your post too and can't wait to read it either. Hope it's the beginning of another series! I have heard such great things about this one! It was even listed in this week's Entertainment Weekly. Thanks for organizing the giveaway! This really does look good, but I think I'll skip the giveaway. I have so many books on my pile now. But I always enjoy coming here to see what's new. Thanks for the review. This one sounds like one of those that will keep me up into the wee hours reading with my covers pulled up to my neck! Thanks for the giveaway! This book sounds amazing and definitely a page turner! I will post on Facebook. Ooh, I like the sound of that! Thanks for the amazing giveaway!! This book has been on my wishlist forever! Thanks so much for the giveaway!! This looks fantastic. I'd like to read Rick Yancey. I don't have any of his books. Thanks for the giveaway. Looking forward to reading this - and a mention appeared on my blog. Thanks! Wow - I am so glad I found your blog - first a Taken giveaway, and now The 5th Wave? And a schedule of his appearances, including one only 2 hours from me? Authors never ever come anywhere within hours of me! Anyway, I would LOVE to win this book. Besides Taken, this was my other most anticipated book of 2013 and I can't WAIT to read it. Thanks so much for the opportunity!!! This sounds great! Thanks for all the info! Hi Natalie and Casey, sounds like a great read, although I don't usually read this genre. All the best with the competition. Love the sound of this book. Thanks for the giveaway. Following you on GFC as LadyVampire2u. I love dystopians! This sounds so good and I've got it on my to be read shelf. This one sounds like it's right up my alley--writing it down. Thanks! This book does sound fantastic! Thanks for the giveaway! Thanks for the giveaway. I´m excited for Lisa Gail Green´s debut novel, I love YA paranormal. Thank you so much for thus giveaway, I REALLY want this book!!! It's just 100% up my alley. (and ooh I must say, it would be such an excellent present to find out on the 13th, the day before my b-day, that I won!! :D (shameless)) Also can I just mention how thrilled I am to see so many unbelievably amazing SCI-FI YA books coming out this year?! It's so fabulous to see this surge! EEp! I cant believe this book is almost out. I cannot wait! and he was in GA? I missed it!